Students selected for membership to this leadership council will have the opportunity to develop self-confidence and leadership skills while engaging in age-appropriate activities designed to meet the unique needs of our community. Dues are $25 yearly. 2019-2020 application is now OPEN! Apply today! Must be a rising junior or senior in high school. Complete the online application. Applications will open March 25, 2019 and close May 1, 2019. Attend a mandatory orientation to learn about the Student Leadership Council (SLC). A completed application consist of the online application and two letters of recommendation from teachers, employers, pastors or other volunteer supervisors. Recommendations should be addressed to Alice Taylor, RMHCA Volunteer Coordinator. No application will be reviewed until all materials are received. 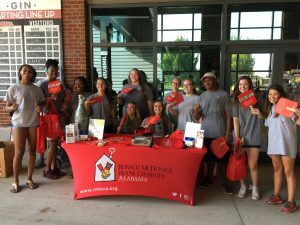 Students are responsible for contacting the RMHCA Volunteer Coordinator throughout the application process to ensure their materials are received. Once a completed application is received, the applicant will be invited to complete the SLC orientation. At this time the applicant will sign up for an interview time. At the end of May, the selection committee will determine the SLC members for the next school year. Twenty (20) students will be selected to serve for as many as two years (depending on whether they are a junior or senior). They will be notified via a letter from the Volunteer Coordinator. Those not selected will be informed via letter and will be encouraged to volunteer independently at RMHCA and submit an application the following year. Note: We respectfully request that students themselves complete the application process, and follow through with the RMHCA Volunteer Coordinator to make sure each portion of the application is completed. Parents are discouraged to complete any part of the application process for their child. Congratulations to the 2018-2019 Student Leadership Council!